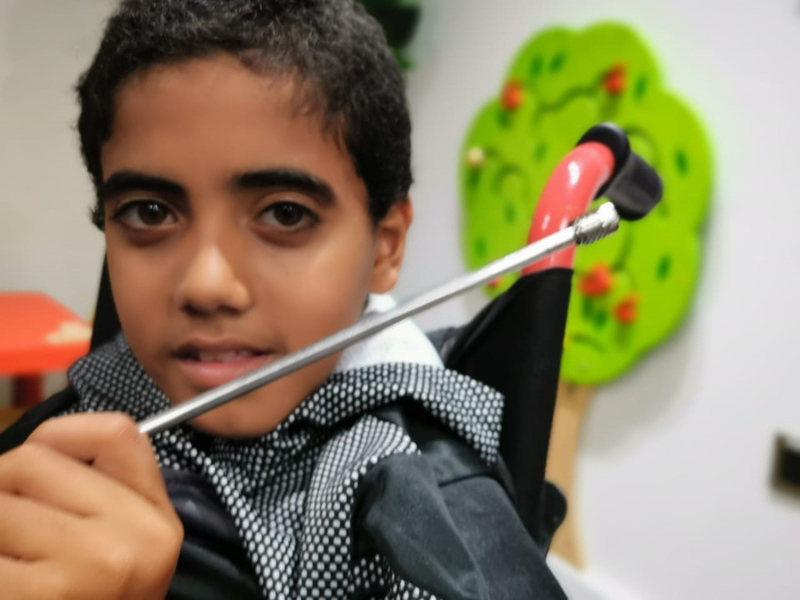 Dubai: A 12-year-old Palestinian boy with brittle bone disease whose legs break and deform at the slightest knock has been flown to Dubai for a life-changing surgery. Muayad Al Arjani will have stainless steel telescopic rods installed through the centre of both his upper and lower leg bones in two five-hour surgeries expected to take place a fortnight apart. The first surgery is slated for April 13 and after his second surgery later this month he will remain in the UAE for six weeks to recover. His treatment and stay here has been provided for by the Little Wings Foundation, a UK-registered charity, that works here in partnership with the Al Jalila Foundation and in Palestine with the Palestinian Children’s Relief Fund. 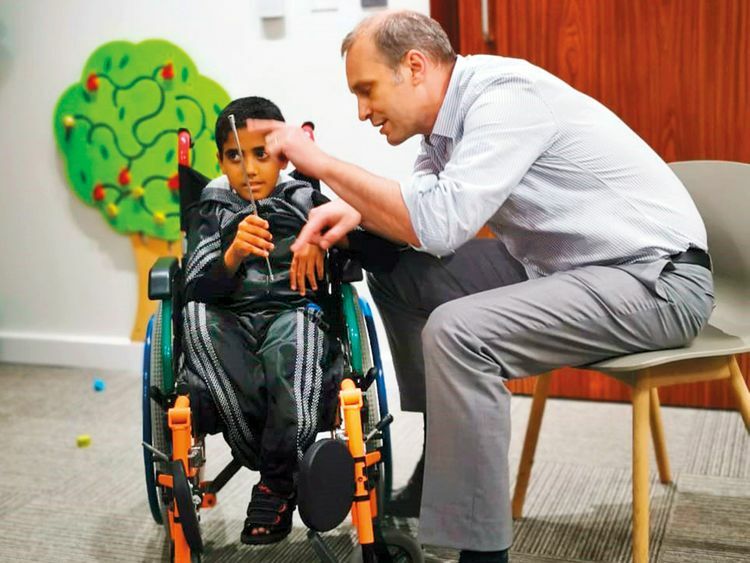 King’s College Hospital London in Dubai has also provided its care and facilities free of cost, as has Pega Medical which is providing the implants, while visas for the boy and his family were organised by a connection to a royal family. “It’s a complex surgery,” said Dr Marc Sinclair, a paediatric orthopaedic surgeon who founded the Little Wings Foundation in 2007 and discovered Muayad during one of his six-monthly surgical missions to Gaza. Sinclair, who has done around four or five Dubai-based surgeries since starting the project 12 years ago, and upwards of 500 surgeries on his regular trips to Palestine, added: “We only bring back the most complex cases that can’t be done in that environment. “If Muayad doesn’t have this surgery now he will remain in a wheelchair for the rest of his life. He also has an older brother with the same condition. Sinclair explained that these cases were no more or less prevalent than other areas of the region affected by consanguinity, which increases the risk of congenital conditions. But, he said, living in Palestine where there aren’t the amenities or facilities of other countries, makes it harder for the sufferer and those around them. “It’s difficult to comprehend how having a child like that at home changes everything,” he added. Muayad’s mother Muna, who has travelled to Dubai with her son, said: “We cannot thank Dubai and Dr Marc enough for this gesture. We are suffering a lot with him in Gaza because there is no treatment there for him. Osteogenesis imperfecta is a genetic disease that affects the bones which begin to break easily. One in 15,000 people is affected globally and there is no cure. It is caused by a lack of connective tissue due to a lack of type 1 collagen. This occurs in 90 per cent of cases due to mutations in the COL1A1 and COL1A2 genes. There are eight types of the disease with differing degrees of severity. Symptoms include a blue tinge to the whites of the eyes, short height, loose joints, hearing loss, breathing and dental problems.